…just a snapshot I took of two children happily at play while waiting for the parade last 17 May. 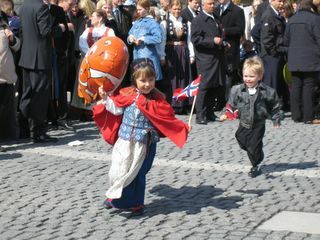 I don’t know them actually, but I thought they were a perfect illustration of what 17 May is all about here in Norway. The 27th of May has always been associated with two things here—children and bunads. This is the time of year that Norwegians (well… the women mostly) go out in their colourful national costumes, the bunad, and watch the parades before going to visit friends and/or relatives. It is actually the Norwegian National Day—the day the Norwegian constitution was established in 1816 after the country became independent of Denmark. At first this had seemed strange to me, having come from a country where independence day is celebrated mainly by a military parade at the capital…but come to think of it, it makes sense. A nation’s future is all dependent on its children. National days should thus be dedicated to them, before anything else.